Directed by James Brown. New Zealand, 2012, 81 mins. What happens when South Los Angeles rugby hits the South Pacific? Follow 38 American high school students as they journey to New Zealand—the land where rugby heroes are made—to take part in a rugby-training regime like no other. 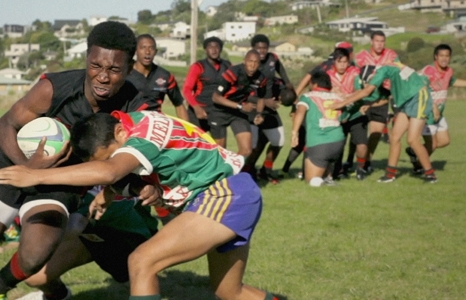 An increasingly popular sport in the US, New Zealand rugby provides these students, and the Kiwi teams they battle, with a rare opportunity to cross national and cultural boundaries, as troubled histories melt away on the field. While the New Zealand All Blacks currently hold the World Cup, the last time the sport was included in the Olympics—1924—the US took the gold medal. Red, White, Black and Blue is a sensitive take on a rough game and its power to unite. Directed by Daniel Kiel. USA. 2012. 35 mins. Thirteen African-American first graders take courageous steps to enter four all-white elementary schools during 1960s segregation.